· Lifetime license with unlimited downloading and re-installing support. · Serial Lost? Free & quick retrieving via Support Center. · Free access to premium add-on downloads. See all awards for AV Webcam Morpher. "Webcam Morpher - BLACK HAT WORN FOR EVERY CHAT!!! Chatting is fun, but you can make it much more enjoyable with Audio4fun's Webcam Morpher, a tool that can help you totally change your image and storm the chat rooms..."
"Pretend to be somebody else in your video chats. AV WebCam Morpher is especially designed for video chats. The program replaces your current webcam video signal with a fake video loop that shows a completely different person. This means that it'll be this character's face - and not yours..."
"The only video chat software which brings a lot of fun for live video chat with unique Webcam Morpher 'nickfaces'. This tool makes your video chat become more interesting. You can choose your favorite "nickface", and you can totally hide your identity in live video chat or disguise your voice using a "nickvoice" to match with any nickname you use online." Users don’t even have to own a webcam; the program will simulate a webcam broadcast for you through nickfaces. Nickfaces are controlled by a popup panel to control gestures and expressions, giving the appearance of normal webcam motion. You can create your own nickfaces or use pre-made nickfaces (available on the website) to change your online appearance; instantly become Jack Sparrow, The Joker, even president Obama (NEW). WebCam Morpher 2.0 works well with many Video Instant Messenger applications like Yahoo Messenger with Voice,ooVoo Application for Facebook (NEW) , Skype, Camfrog, PalTalk Messenger, Windows Live Messenger, etc. 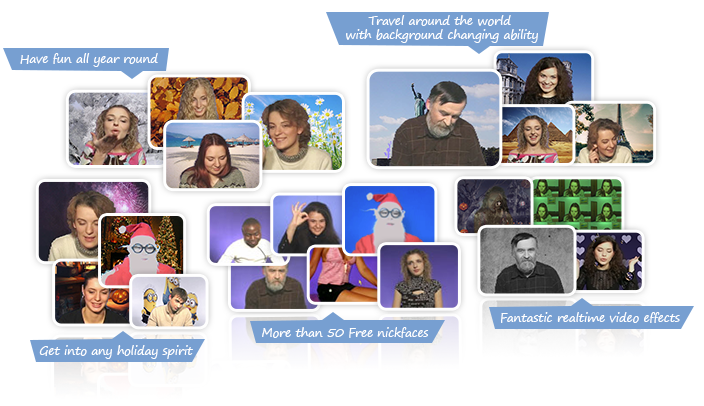 For you to choose from; just select your favorite personality from up to fifty nickfaces. They can smile, laugh, talk, even flirt like real people. For you to color, even replace your video background, adjust the brightness, contrast, or apply noise reduction, band pass filter, and more. Create your own nickfaces using the Nickface Maker Module included in Webcam Morpher. Now it’s easy to quickly share clips with friends online with this new feature. Get ready for a hilarious new experience in video chat rooms. Choose your favorite nickface, and entertain and amaze your online chat friends. Create your own cool video blog or video diary using your webcam and our software. Webcam Morpher Recorder can help you create unique video clips for your own blog or video diary. Create any kind of video clip; play famous people or even create dialogs between multiple characters; you control their looks, their gestures and their voices! Add video effects, in real time, to create truly unique personas. Place your character in any environment; you can easily put any image behind your "nickface" using one of the prepared backgrounds, or use your own photographs, or any image; even change it one the fly. Now there are more "personality nickfaces" for you to choose from. They can smile, laugh, talk, and gesture like real people; this is your new way to endless fun... Get them now!